This page also features links to various items and updates concerning Norval’s injury. Winter 2008: We are enjoying sunny weather with chilly mornings and nights. Norval has been working hard at physio and is now able to walk a couple of kilometers on the beach with his dogs. He has a set of exercises to do several times a week to help with overall strength and endurance. He can do one proper full-length push-up so his upper body strength is improving. He has been busy with sound and video on his computer and has started writing an album of music inspired by his accident and his time in hospital. All of my frienz that I’m doin’ real well! Have a safe and happy festive season and a wonderful New Year! Norval is continuing to recover well and is getting more mobile everyday. He can mow the lawn and coast down the drive on his bike without pedalling. On Sunday I had a go on a supersized bungee-powered baby bouncer at the market. I was able to bounce 15-20 feet in the air and it was a hoot! The new kitchen is nearly finished upstairs and is looking good. Dogs are well, I’m getting better on the guitar and the weather is great! It’s been eleven months since my accident. Everything is going well with continual improvement. There is still a long way to go and I will be ready to do some light weight training in Jan next year. I can walk around town doing errands for an hour or two now. I still use my walking stick for stairs, gutters, ramps and hills. I can play a few chords on the guitar but I’m still way off the pace..
My insides are behaving themselves but still pretty slow. I have had a show of my paintings at Tigerfish Gallery in Torquay and sold a few, included one that I painted this year. I have been busy at home pulling out the old kitchen and half the bathroom redady for the new. I can swing a hammer and do light demolition..
Have not been swimming for a while but it will be spring in a week. Hope you’re all well, love yaz! The boys from the bike shop set me up with a wind trainer so I can pedal my jump bike like an exercise bike. I am going to set up the official SkimUnity portable DVD player so I can watch bike vids while I pedal. Now can anyone design me a skim trainer? Seriously though, I may not be able to resume skimboardin and crazy bike stuff if the doctors think my neck is in danger. I have been thinking about low-impact sports like kite-flying, golf, and pig-hunting. Physically my left arm/shoulder are much stronger. I can swim 12 1/2 meters in 17 seconds. Beat that, Thorpie. Walking is coming along although at night, with the beer goggles on, I am pretty much useless. Digestion is still very slow which is a drag. I have to be careful about muscular aches and pains like anybody else, especially now I am getting a little more confident. All in all, I am very happy with the rate of my recovery and thanks everybody for your support! Norval is now able to walk around the block with a walking stick… Norv has been out of hospital just over three months and it is just over six months since his accident. He is now able to walk around the block including the steep hill up Jonson St to the front gate. Norval is enjoying increased stamina and can get thru the day with only a short rest after lunch. Bodily functions are all gradually returning to normal and he is off medication. However there is still a long way to go with the left arm and leg significantly weaker than the right side. The left side is also prone to cramping and “clenching” when under stress. Wednesdays are busy for Norv with acupuncture, Home Care and hydrotherapy. He recently passed his driving test and has a licence to drive an automatic with power steering and indicators on the right hand side. Norval will be exhibiting old and new paintings at Grant Forbes’ Tigerfish Gallery, Torquay sometime soon. The opening has been pencilled in for May 15. Norval is continuing to recover well following his spinal injury. On Xmas Day Norval left the Princess Alexandra Hospital in Brisbane on a ten-day pass. He flew to Melbourne with his brothers to spend Xmas with the family. On Boxing Day they drove up to Mt Hotham for a week in the high country. Norval returned to the PA Hospital on January 4 and was deemed well enough to be discharged. Following final X-rays, tests and assessments Norval flew to Canberra on Jan 5 to stay with his brother and family for a few days. Norval is looking forward to returning to Byron Bay soon and taking up where he left off on Sept 23, 2006. Norval Watson had a bad accident on September 23, 2006. He suffered severe spinal injuries in a fall from his mountain bike in the hills behind Byron Bay. Norval, the owner/operator of this site, is presently recovering well in the Spinal Unit at Princess Alexandra Hospital, Brisbane. 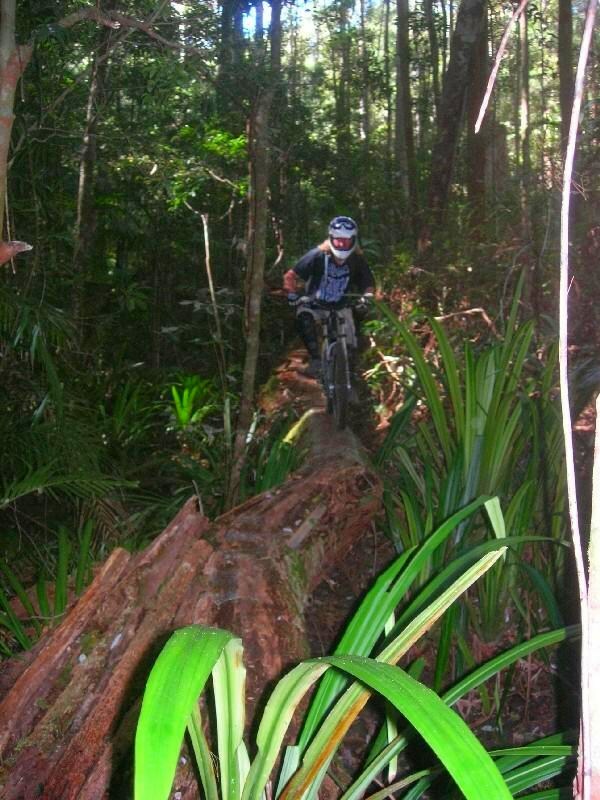 For those who are interested here is a photo of me on the log where I had my accident. The photo was taken several weeks before the accident by James Flockton. In the photo there is a two meter drop directly below me to a rocky creekbed. I have already ridden most of the log, it is 20 meters or more in length overall. My accident occurred at bottom left of the photo when my front wheel slipped off to the left (or right from the rider’s perspective) of the log. I thought I could bridge the gap from the log to the bank of the creek but instead the weight of my downhill bike (@21kg) dragged my straight down and I went head first into the dirt before I could get my hands out in front of me. There was a bright flash of colored light, a loud crack, and I ended up head down, bum up, with my chin tucked into my chest and unable to move my hands or legs. I immediately assumed I had broken my neck and was a complete quadruplegic. My first regret was that I would never play guitar again. Immediately I went into spinal shock and lost 90% of my breathing capacity. The three friends I was with saw the crash and initially thought nothing was wrong as it was such a slow, unspectacular fall. However they soon rushed over when they realised i could not move. At first they were reluctant to move me but I told them I would suffocate if they did not. Phil Morrow has a current First Aid certificate so he supervised Grant Woolfrey and Mick McClelland while they very carefully laid me on my side. Phil and Mick ran off up the mountain to call for help while Grant stayed with me. Unbeknownst to me he started poking me with a stick to see if I had any feeling in my limbs. Then we were much happier. More hard poking made us aware that I had minimal feeling in all limbs. Then more tests revealed almost imperceptible movement in all limbs. It was then that I stopped thinking about how to end it all and adopted a positive attitude of how to get better. It would be another 20 minutes before the first ambulance crew arrived and more than three hours before the chopper crew winched me up through a small gap in the forest canopy into the helicopter but that is a story for another day. congradulations norv. you are an inspiration. Awesome news Norv. we’ll have walking stick races soon. Ha ha I better order a new carbon fiber superstick! Good words man, that could be ha wicked song! I´m glad you are happy with your life and friends, thats whats matter. Ok take care now and don´t forget to visit us. hiya man its paulie heres my email ring again soon cheers! hi iam also recovering from neck SCI . how are you ? are you able to run ? Hi Peter, Nice to hear from you. 4 years after the accident i can jog/shuffle 50 meters, swim 500 meters, walk for sevaraL km (but only in Paris ;)) my hands are pretty numb and stiff and my “digestion”etc is a bit… slow. How about you? hi . you are 500% better than me . iam only 3 months post injury . i can walk 200m . do you sweat or have problems with termoregulation, do you make progress still ? I don’t really sweat but I get “moist” so I do hAVE some PROBLEMS WITH thermoregulation. I still make progress but its really important to have a regular physio program and stick with it. It takes a long time to increase your stamina so be patient! And remember that everyone’s SCI is different.